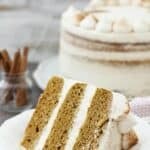 This Pumpkin Layer Cake with Cinnamon Honey Mascarpone Frosting is layers of a light and fluffy homemade pumpkin cake that is full of spiced pumpkin flavor. It’s finished off with a cinnamon honey mascarpone frosting which is a delicate balance of sweetness and spice. 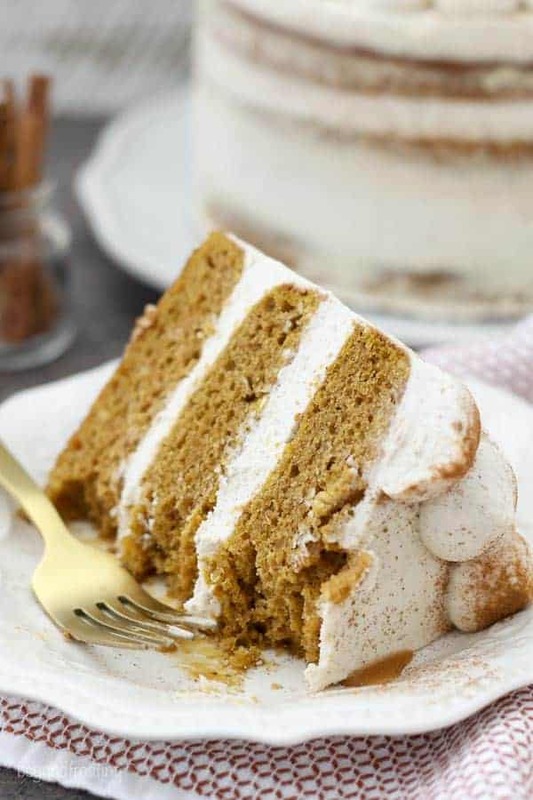 You’ll never hear me say that I am tired of pumpkin recipes, it’s surely one of my favorite flavors to eat. And because society has decided that there’s only about 3 months out of the year that are fit for pumpkin recipes, I am going to soak it all up. Ever since making my Moist Pumpkin Cupcakes, I knew there would be more pumpkin cakes and cupcakes in the future. 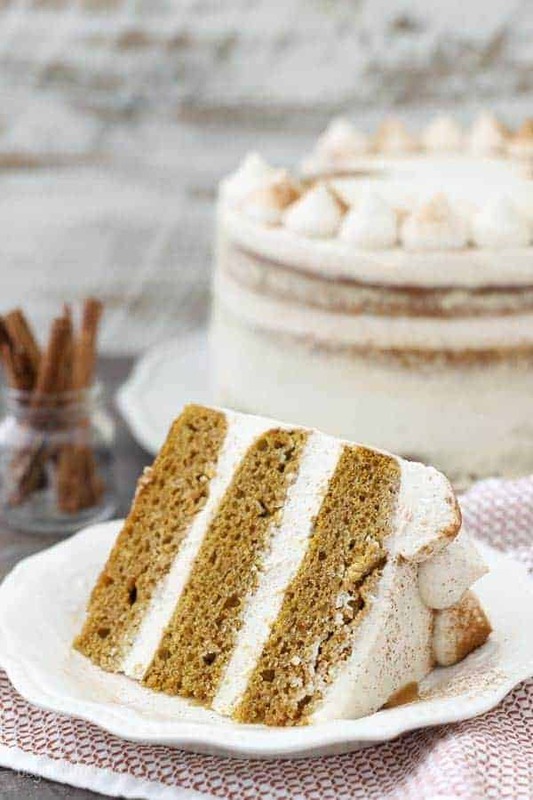 We’re starting with this Pumpkin Layer Cake with Cinnamon Honey Mascarpone Frosting– a mouthful in more ways than one. 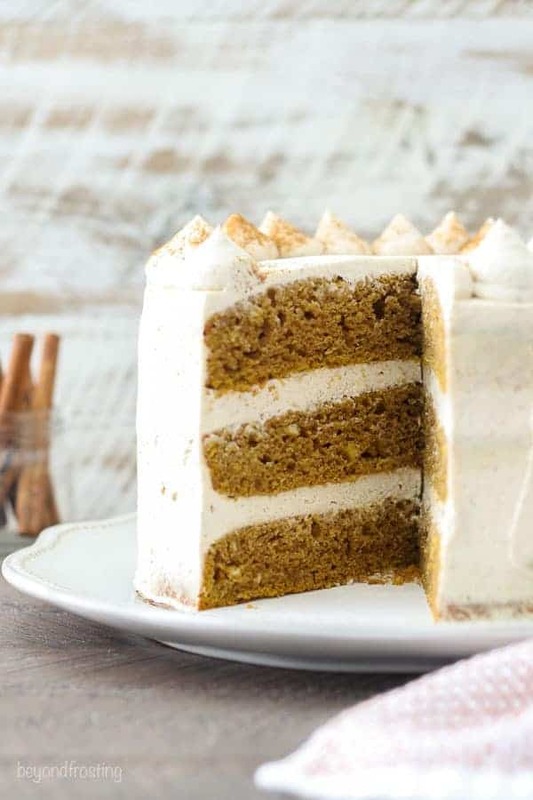 The layers of homemade pumpkin cake are light and fluffy, and full of spiced pumpkin flavor while the cinnamon honey mascarpone frosting offers a delicate balance of sweetness to this recipe. 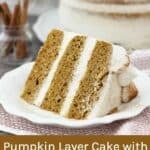 The pumpkin cake is quite easy, and since it’s an oil-based cake recipe, you don’t have to waste any time waiting for the butter to come to room temperature. Since the cake batter is heavier, it will not rise quite as much, but I also like to use bake even stripes when I am baking cakes so that my cakes do not dome too much. It’s such a shame to waste all that cake! Once your cake is baked and cooled, it’s time to make the frosting. I debated about the type of frosting to use for this recipe for quite some time. 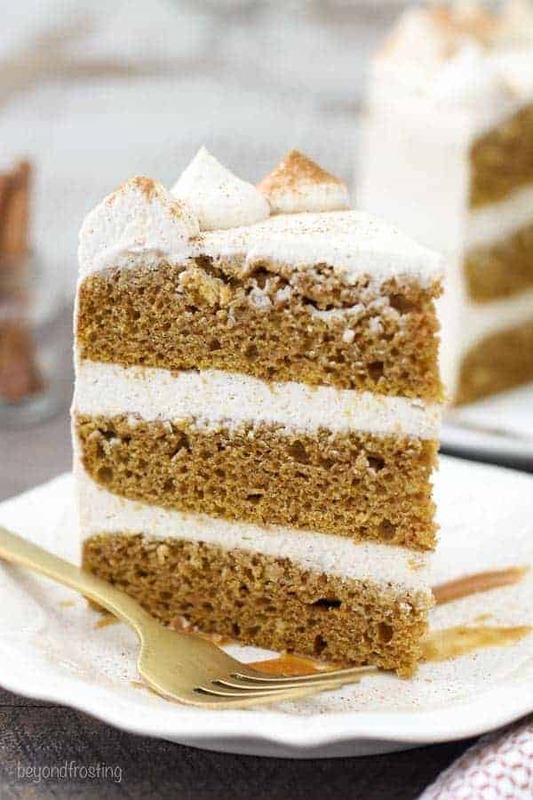 Most pumpkin cakes or cupcakes usually come with some sort of cream cheese frosting and I am totally not opposed to that. However, I just wanted something a little different for this cake. Over the summer while dining in Las Vegas, my pancakes were served with a honey mascarpone whipped cream, which I almost enjoyed more than the pancakes themselves! I knew this would make a killer frosting one day. This cake was the perfect opportunity for the honey mascarpone frosting. The cinnamon and brown sugar were a late, but welcomed addition. 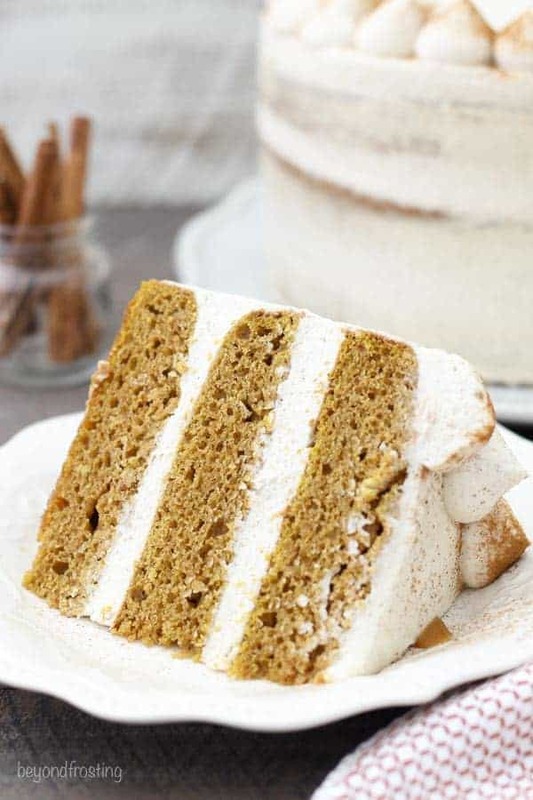 This frosting has a subtle sweetness that allows the cake flavor to really shine through, but then it finishes with the cinnamon spiced whipped cream texture. It’s light and airy, just as you would expect a whipped cream frosting to be. Mascarpone whipped cream is fairly easy to make. First beat the mascarpone together with the honey, brown sugar, cinnamon and vanilla extract. Once combined, you will slowly pour in the heavy whipping cream while beating at a low speed. The mascarpone will combine with the heavy cream to cream to make a liquid consistency. Then it’s time to add any remaining heavy cream and increase the speed to beat the frosting until soft peaks form. I added a little bit of powdered sugar for sweetness and stability. I decided to give this cake a most rustic look and add only a thin layer of frosting to the outside edge, but there’s plenty of frosting in the middle of this cake. To garnish, I used some leftover frosting and a large open round tip to pipe small florets, which I sprinkled with cinnamon. Overall, I am SUPER happy with how this cake turned out, and because it’s not overly sweet, I feel like I could get away with eating it for breakfast. What do you think? In a large mixing bowl, combine the sugar, vegetable oil, eggs, maple syrup and vanilla extract. Beat on medium speed until the eggs and oil are well incorporated and the batter is lighter in color, about 2 minutes. Scrape down the bowl as needed. Next mix in the pumpkin and beat until well combined. In a medium sized bowl, combine all remaining dry ingredients. Then, add half the dry ingredients to the batter followed half the milk and beat until it starts to combine. Finally add the remaining dry ingredients, mixing on low speed while pouring in the milk and beating until all of the ingredients are well combined. For the frosting: Beat the mascarpone cheese for a couple minutes, scraping down the bowl occasionally. Add the brown sugar, honey, vanilla extract and cinnamon. Beat until all ingredients are well combined. While beating at medium speed, slowly add the heavy whipping cream until the mascarpone cheese resembles a liquid consistency. Scraping the bowl as needed. Continue adding the remaining heavy whipping cream and beat until soft peaks form. Next add the powdered sugar and continuing whipping until stiff peaks form. To assemble the cake, use a cake leveler to cut the domes off the top of the cake as needed. 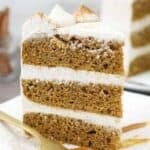 Place a dollop of frosting on your cake board and place the bottom layer of cake on top of that. Place half of the whipped cream in a large piping bag fitted with a large open round tip, or simply cut off the end of the piping bag. Pipe a layer of frosting and spread evenly. Add the next two layer of cake and repeat the above steps. Use your piping bag to fill in any gaps between your layers and to create a rustic crumb coat. Using an offset spatula or icing smoother, to add the remaining frosting then wipe away any excess. Use remaining frosting to pipe the florets on the top of the cake using an Ateco 809 tip (large open round) and dust with cinnamon. This cake must be refrigerated. my frosting curdled as it was my first time working with marscapone cheese.. i’m afraid my ingredients tempts were off thus causing the curdling. I’m a bit disappointed as i wasn’t sure if this was the consistency so i went ahead and frosted my cake anyway(stupid mistake #2) whoever is making this cake just a pointer.. be sure to keep all your ingredients at room temp or similar temps to avoid this and also keep in the fridge to set once you make the frosting for at least 30min. Hi Shelby, that might have been your problem here. The heavy whipping cream and mascarpone cheese need to be cold, straight out of the fridge. Sound like you have over whipped your frosting if it started to curdle as well. Quick question: how thick is this icing? I’m wanting to make a cake for my European friends (so not the overpowering sweetness that is traditional American buttercream), but I’m wanting to decorate it with Russian piping tips. This sounds like it’s more whipped and might not hold shape super well? Can you comment on the stiffness? Hi Sam, it’s more of a whipped cream. It thicker but I am not sure about Russian piping tips with this frosting. I use plenty of regular piping tips with it, open stars, 2D and 1M were all fine. Just an update – first, it’s a great icing. I added more honey because I couldn’t quite taste it, but otherwise the recipe is great and my friends approved. I left it in a really cold fridge overnight, quickly added color, and piped through some Russian tips. The more open flowers worked ok, but the others we just giant blobs hahaha, but that’s not surprising! Thanks again for the feedback and for a great recipe! That’s great Sam! Thanks for following up, it will be helpful to others who might be interested in the Russian tips!